The 1950’s were difficult for Hakalau Plantation and the question of viability was raised repeatedly. Financial losses and heavy debt resulting from the 1946 tsunami were made worse as [industry-wide] labor strife erupted. Strikes resulted in months of lost production and new labor contracts required significantly higher wages and more employee benefits. Plantation managers and workers implemented new systems to improve efficiency of operations, most notably vastly increasing mechanized harvesting. Workers were aware that the existence of the plantation and their jobs were at risk. Improving efficiency, even if it meant a reduction in jobs, was understood to be essential. The single capital improvement deemed essential to the survival of the plantation was the building of roads to facilitate mechanical harvesting. Most other capital improvements were delayed and equipment was leased instead of purchased. The process of abandoning outlying villages and selling houses to workers on a removal basis began. The Hilo Coast plantations worked together to solve common problems like studying the road system and agricultural research to support improved fertilization practices and cane ripening studies. Included in this detailed timeline of the 1950's are excerpts from the annual reports. Annual reports provided courtesy of the Edmund Olson Trust Archive. Kolekole Park Bridge was built using steel from a railroad bridge over Wailuku River that was damaged in the 1946 tsunami. ​General Condition of Properties: As I mentioned in Last year’s annual report, the two biggest problems at Hakalau are the field roads and camp houses. The lack of good road material makes it very difficult to maintain our roads or build new ones which will stand up to heavy traffic. All the other properties are in fair condition…. Harmonious employee relations were disrupted by two short strikes which occurred during the year. The first one was called by the Union…to protest the layoff of several employees. It ended … when the Union accepted the fact the plantation could not maintain on their payroll employees for whom work was no longer available. The second strike was called by the Union … to enforce their protest against the planters cutting their own cane. General: The years since 1946 when the tidal wave struck, have been difficult ones for Hakalau. Because of the damage to the factory in April 1946, there was only 10,089 tons of 96° sugar produced instead of an estimated 26,000 tons…This resulted in the future crops being completely out of schedule and in order to salvage the old cane …The year 1951 sees us getting back to a more balanced crop, while the year 1952 should find us back to a normal cropping cycle. Crop of 1951: …Of the total tons of net cane harvested, 74.8 percent was hand cut and flumed and 25.2 per cent was harvested by mechanical means. Agricultural Research: A new Crop Log Laboratory for follar analysis of NPK and total sugars was opened at Hakalau on June 1, 1951. This is a cooperative project for the four Hilo coast plantations…While the project is still in the experimental stage, we expect to accumulate data that will prove of definite value in planning future fertilization practices and cane ripening studies. Mill and Boiling House: The factory operated very efficiently throughout the year with no major breakdown. A critical water shortage in September caused a temporary slow-down of production but rains came in time to avert a complete shutdown. 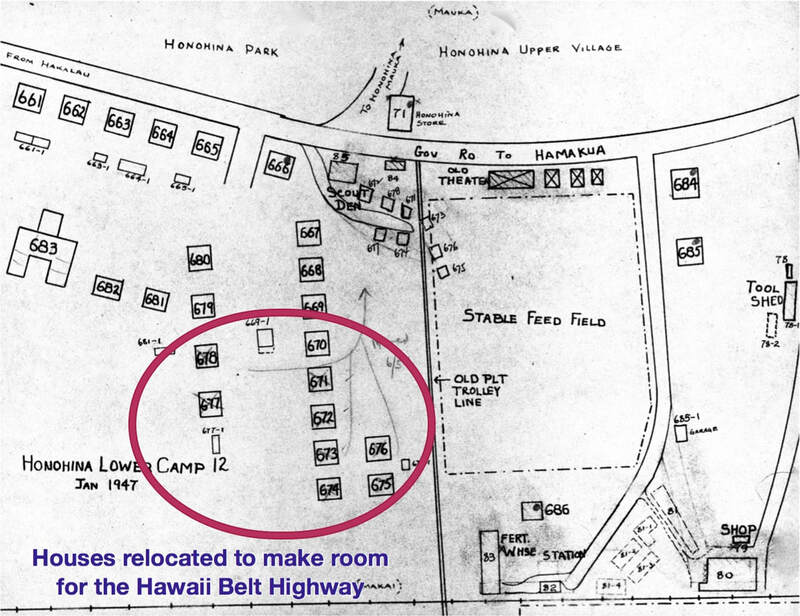 General Condition of Properties: The construction of the new Territorial Highway through the plantation necessitated the relocation of ten houses at Hakalau upper camp, eight houses at Honohina, five houses at Ninole, and the building of a new stable at Honohina. During the shut-down period, the cane unloading station at Kamaee had to be rebuilt on a new site below the new highway, and the Honohina main flume had to be relocated at several points. All of the cost of moving the above items was borne by the Territory and in the moving and relocating the general condition of our properties has been improved...The care and maintenance of company houses and village services progressed at an excellent level. Several units received major repairs and alterations while emergency and minor repairs continued on a better than normal basis...The opening of several new quarry sites in the upper section of the plantation offers promise of better road construction at lower cost than was previously attained. Weather: Weather during 1951 was very beneficial for growing crops, and damage from mechanical harvesting was much less than was experienced in previous years…We experienced several prolonged periods of dry weather during May and June, and September was the driest since 1917…Flume water was exceptionally low during these dry periods and springs supplying domestic water dried up to a point where we experienced a severe water shortage. Industrial Relations: A new agreement between the Company and Sugar Workers, ILWU Local 142, effective September 1, 1951, was ratified on September 15 and will remain in effect until August 31, 1954. …Although the long term agreement has every assurance of labor peace throughout its duration, the substantial wage increase granted our workers can only be met through an intensified effort on the part of all to reduce production costs and increase yields. General: As of September 1, 1951, your Manager, Mr. Martin J. Black, was granted a leave of absence from Hakalau Plantation to assume Management of Onomea Sugar Company, and the writer [A.T. Hossack] was appointed Acting Manager at Hakalau to serve during Mr. Black’s absence...The year 1951 has shown a gradual improvement in sugar production over the past two years. … Rising costs due to wage increases and increased cost of materials have so far more than offset any gains realized from larger crops …. Considering the capital investment and the risks involved, profits have been meager and it is apparent that there are still serious problems unsolved. In the overall, however, it is reasonable to say that progress has been made…While we look to the future with encouragement, the need for full cooperation of stockholders and employees cannot be overstressed. This is essential for the success of the Company, and upon its success rests either directly or indirectly, the welfare and livelihood of hundreds of individuals and families. Crop of 1952: …Of the total tons of cane harvested, 70 percent was hand cut and 21 percent was rake harvested. Flumes delivered 70 percent of the cane to the factory and 30 percent was hauled by truck. General Condition of Properties: The entire flume system has been well maintained and is in excellent condition. Through the use of creosoted and wolmanized lumber in the upkeep of high trestles and main lines, future maintenance costs of these flumes will be materially reduced…Mechanical harvesting and cultivating equipment is in good condition but increased mechanization of these operations may necessitate the acquisition of additional equipment in the near future. Roads: The major difficulty facing this Company is the inadequacy of the present road system. Only 1.6 miles of new roads were constructed during the year, but it is hoped that this situation will be improved during 1953. An engineering survey of road construction for the four Hilo coast plantations is now under way and much useful information should materialize from this study of our road problems. Industrial Relations: Amendments to the Wages, Hours and Overtime, and Work Opportunity Sections, of the Agreement between the Company and United Sugar Workers, I.L.W.U. Local 142, were ratified on October 15, 1952, and became effective September 1, 1952 …The amendments granted our workers a wage increase and other employee benefits. These increases can be met only by every worker doing his part to reduce costs and increase productivity. Cane Planters: …By December 31, 1952 about 60 percent of our cane planters had signed the cane purchase agreements making them independent cane growers. The remainder continue as adherent planters, but we anticipate that additional individuals will assume independent status during the coming year. General: The past year has been one of retrenchment. It became evident, very early in the year, that capital expenditures and operating costs would have to be reduced drastically if the Company were to meet its obligations and continue in business…All of our employees were advised of the challenge which faced the company. The fact that we were able to record a small profit was possible only because of the loyalty and fine cooperative spirit of our employees. They worked diligently in helping to surmount the many problems which arose throughout the year...The recent development of the in-field transport unit has changed the entire outlook for mechanical harvesting. It is possible that future mechanical developments may point the way for savings in our harvesting operations. Before we can secure the full advantages of improved mechanical harvesting methods, however, our present inadequate road system must be overcome...Better cultural practices and favorable growing conditions are resulting in improved yields. Future crops look promising. But the ever increasing costs of labor and materials have been offsetting the gains that should have been realized from increased sugar production. …While at times drought conditions aided harvesting, at other times during the year the shortage of water both for fluming of cane and milling requirements posed difficult problems. Your manager and all of those associated with him did a fine job in producing this record crop. …With numerous independent land holdings within the outer boundaries of Hakalau, coupled with the high percentage of planters cane to handle and with a very inadequate road system for transportation of cane, Hakalau is one of the most difficult of the operations within the Brewer group. Unsatisfactory profits and lack of capital funds will delay prompt correction of many of these problems. …With total debts of approximately $2,327,000 as of December 31, 1953, and current assets of some $610,000 and with the heavy tax burdens of today, it is apparent that it will take a long time to fully settle these obligations. ….Then, too, unpaid dividends on the cumulative preferred stock, which as of December 31 last totaled $193,750, must be paid before any dividends can be declared on the outstanding common stock of the Company. …If there was ever a company needing the full effort and cooperation of every person connected with it in order that it may continue in business, Hakalau would qualify as such. Time and the response of those involved will provide the answer. Crop of 1953: The 1953 crop was the largest in the history of Hakalau Plantation. Weather: The total rainfall of 86.78 inches at the Makai station was the lowest since 1933, the year 1953 being the fourth driest year on record. …The prolonged drought, which lasted throughout the entire year, caused several acute operational problems. Flume water was critically low and harvesting schedules had to be frequently re-adjusted to allot more cane area for truck transportation. …Shortage of water at the factory caused jamming of cane in the mill carrier; also, in the boiling house evaporators and pans often operated on low vacuum due to inadequate cooling. Harvesting and Transporting Methods: Several changes were made during 1953…The Brewer cutter, which had been discontinued for several years, was put back into commission…When used in conjunction with light cane rakes for windrowing, uprooting of cane and other field damage is minimized. Two additional cane buggies were put into operation to haul cane to roadsides and a fourth cane buggy has been ordered for 1954…The new Kamaee unloading station, located on the Hamakua side of Hakalau gulch, was put into operation early in April and has proved to be a success. This station was equipped with a hoist so that cane could be side unloaded from the truck. Cane is unloaded into a large slat type conveyor system which, in turn, feeds the cane through a carding drum into the large main flume for delivery to the factory. Feeding of cane is very uniform and the conveyors can handle up to 100 tons of cane per hour. A very thorough washing of the cane is accomplished as the cane moves through the storage flume to the mill carrier. The entire conveyor installation was planned and fabricated by plantation employees. Shortage of flume water and heavy yields made it necessary, and dry weather made it possible, to mechanically harvest a much greater percentage of the crop than had been anticipated. …50.3 per cent of the group was hauled by truck…and 49.7 per cent was flumed to the factory. All of the trucked cane was mechanically harvested with the exception of 34,729 tons which were slash cut and 6,488 tons hand cut and flumed to truck loading stations. Lack of roads was a serious handicap, but by building short spur roads into some of our fields, it was feasible to haul cane from areas previously considered entirely unsuited for mechanical harvesting. However, had it not been for the exceptionally favorable weather, the road system would still have been inadequate and it would have been quite impossible to harvest the area scheduled. 1) Record average daily production of 120 tons 96° sugar for the crop. 2) New weekly record of 928 tons of 96° sugar. 4) Tons net cane ground per hour increase to 53 tons as against 50 in 1952. Roads: …The entire road building problem at Hakalau is most difficult due to the rugged terrain, diverse land ownership, and the proportion of planter’s cane ground at Hakalau. A thorough financial study must be made before any large capital expenditures can be undertaken. New road construction is being deferred to the extent possible pending the completion of such a study. Houses and Buildings: Village services were maintained on a normal basis during the year. Emergency and minor repairs of Company houses and buildings were attended to as required. A good deal of ultimately necessary maintenance was deferred. General: Improved cultural practices and better can varieties, together with excellent growing conditions, have all contributed to the marked and steady improvement shown in Hakalau’s sugar production during the past three years. Future crops look promising. A great deal of credit for the improvement is due to the fine cooperative spirit of our employees. …Mounting labor costs are largely off-setting gains secured by higher yields and with a lower sugar price forecast for 1954, the future is not as bright. A crop of 30,685 tons of 96° raw sugar—a record for the second consecutive year—is indicative of the fine effort and the progress being made in operations…Again, however, the end result—profit of but $33,413—is to say the least discouraging….Hakalau is definitely a marginal plantation. The need for full cooperation from all concerned is apparent if Hakalau is to stay in business. Harvesting and Transporting Methods: Of the total … net cane harvested 55 percent …was cut by hand and 45 percent… was cut by machine. Considerably less cane was cut by hand than in 1953. …Virtually all of the machine cutting was performed by a modified Vee-Cutter designed by our staff. Several other Brewer plantations have recently built this type of machine for use in their harvesting operation. An adequate supply of flume water throughout the summer months was helpful in keeping truck and flume schedules in balance. A total of … 52% of the total net cane harvested was flumed directly to the factory. The remaining …was transported by truck to the Kamaee unloading station where the cane was discharged into the conveyer system which delivered it into the Kamaee flume for final transportation to the factory. Factory: …With the larger crops of the last two years, milling capacity has been a serious bottleneck…. Grinding rate during the first month of the 1955 crop has shown a marked improvement over 1954, indicating these changes have helped. Roads: During 1954, 3.7 miles of new roads were built… During the early part of 1954 road construction was curtailed. The problems of diverse land ownership and the large proportion of planters’ cane, coupled with a heavy debt burden, were the reasons appropriations for road construction were restricted. The need for an expanded road building program is becoming more urgent. However, as the planters’ contract is presently written, there is little incentive for the plantation to build roads to harvest their cane…In recent months a new quarry, in the middle Kamaee section of the plantation, was opened and materials obtained from the quarry were found satisfactory for road building. This means that in the future more miles of road can be built per dollar expended. 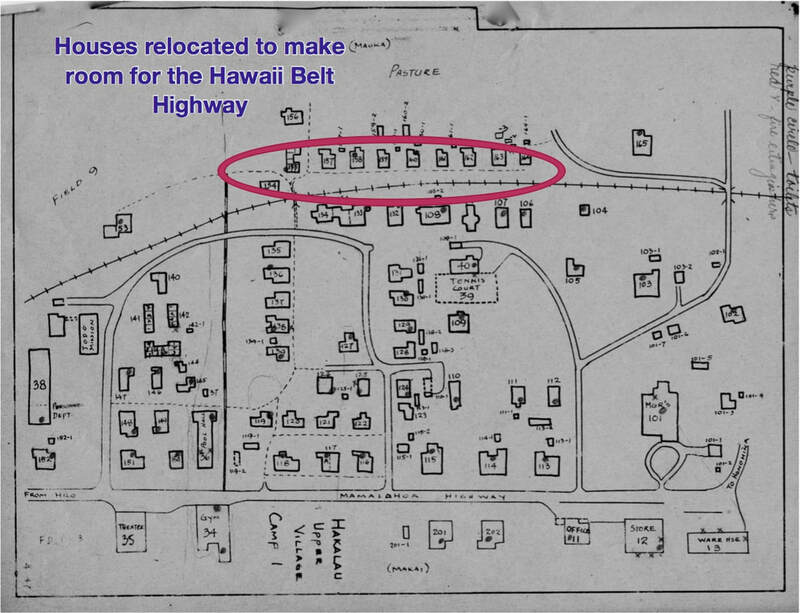 In 1954 much of the road building material came from Pepeekeo and from a quarry near the Hilo Airport. Houses and Buildings: No new buildings were constructed during the year. Emergency repairs and minor alterations were made on existing houses and buildings to keep them in good condition…At two joint Management-Union Housing Committee meetings held during the year, the Union representatives expressed satisfaction with the village services. Health and Safety: Membership in the Medical Plan increased due to revisions in the Plan negotiated last April…Pepeekeo Clinic and Hilo Memorial Hospital continued to provide employees and their families with excellent hospital and medical facilities. Regular visits by a Company nurse helped maintain a high community health standard…..
Labor Relations: Labor relations were good on the whole and employee morale high. The only difficulties were two short work stoppages by Mechanical Harvesting Crew early in the year due to impending operational changes…Supervisors were given special training in a wide range of subjects, including safety, union contract administration, and handling grievances. General: With the price of sugar and molasses down sharply from 1953, it was essential that this plantation be operated on a strict economy basis. Capital expenditures over the past few years have been curtailed to a figure well below annual depreciation. However, this cannot be continued indefinitely because many basic items are wearing out and the need for further mechanization has become progressively greater…Substantial progress has been achieved in increasing yields and lowering production costs. A great deal of credit for these improvements was due to the fine cooperative spirit amongst the employees. The 1955 production…is greater than 1954 production which in itself was a record crop. Also, sugar yields … broke the record set in 1954…However, the profit for 1955 was modest, amounting to $101,000, and the debt, after deducting quick assets, was only reduced by $61,000, still leaving a heavy net total debt of $1,719,000. In addition there is a past service pension cost to fund which would take approximately $1,435,000. …profits at Hakalau are far from adequate to justify the capital employed in the business and the risks taken by stockholders. An estimated 1956 crop of 31,000 tons, coupled with the present outlook for quota limitations on sugar marketing and prospects for lower returns for sugar, along with the present high labor costs, does not offer promise for an improved profit in the current year. There appears no prospect of dividends on common stock for a very long time to come. Unpaid dividends on cumulative preferred stock total $243,750 and are ten years in arrears. No dividends can be paid on any stock until the capital deficit of some $478,000 is liquidated. In order to maintain this plantation as an operating entity it becomes more and more apparent that there is every need for the full effort and cooperation of every individual connected with the organization. Harvesting and Transporting Methods: The cane tonnage harvested by machine was substantially increased over 1954 with a decrease in cane harvested by hand. In 1955 seventy percent of administration cane was mechanically harvested, compared with sixty-three percent in 1954. With such an increase in machine harvesting, the new roads constructed during the year minimized damage to fields even though the weather was adverse for harvesting much of the time…. Factory: In the factory, three major breakdowns occurred during the year, all involving the 4th mill. …The result was reduced extraction and an increase in overall factory losses for these periods. Roads: During 1955, 11.2 miles of new roads were built with a total expenditure of $185,000. …The lack of good access to the Kamaee quarry, and the difficulty of securing a sufficient volume of rock from this source, made it necessary to have most of the road building material hauled from Hilo…An engineering survey has been made of future roads needed and a tentative estimate of the extent of this program calls for an expenditure of over $200,000 per year through 1960. Even when this minimum installation is completed, there will still be many additional miles of road required for really efficient operation. New Planters’ Contract: A new “Processing and Agency Contract” was offered to cane growers at the beginning of the 1956 crop, whereby both parties would benefit from the savings due to mechanical harvesting. Acceptance of this new agreement would make it practical to construct roads into planters’ areas. House and Buildings: Village services were well maintained. Emergency repairs and minor alterations were made to many houses to keep them in good condition. Progress was made on a plan to eventually eliminate isolated villages. The residents of Kamaee Korean and Ah Ling Camps were moved into more centrally located areas. President’s Report (Boyd MacNaughton): Net profit after taxes was $56,666 compared with $101,212 for 1955. Despite a higher return for sugar than in the previous year, Hakalau is still burdened by a heavy net total debt of $1,650,000. In order to increase operating efficiencies, it will be necessary to further mechanize operations at Hakalau. This requires the expenditure of approximately $1,500,000 during the next nine years for roads alone, of which $1,000,000 will be expended in the next three years. Without these roads there appears little prospect of operating at an adequate return in the future. On March 7, 1957, a moderately severe tidal wave struck the Hawaiian Island chain. The sea wall, which was constructed after the 1946 wave had seriously damaged the Hakalau mill, proved its worth by diverting the wave, with the result that there was only little damage sustained. 1956 Crop: …Poor growing conditions during 1955 resulted in retarded can growth and the poorest juice quality since 1949. Soil Conservation: A soil conservation program was begun early in the year with the assistance of the United States Soil Conservation Service. Diversion ditches are being constructed in plant fields to reduce erosion caused by heavy rains. The storm ditches already constructed have proved of great value in reducing damage during periods of excessive rainfall. Harvesting and Transporting Methods: Mechanical harvesting again showed a substantial increase over prior years with a decrease in cane harvested by hand. Factory: Inability to cope with the large volume of trashy cane was the main bottleneck in factory operations. Improvements in the existing cleaning plant are contemplated during the 1957 off-season. Roads: During 1956, a total of 7.6 miles of new roads were constructed for an overall cost of $114,314. The major portion of future roads will be constructed into cane areas cultivated by planters. New Processing and Agency Contract with Growers: The Department of Agriculture approved a Processing and Agency Contract whereby the company was authorized to charge the grower 42 percent of his gross returns for sugar and molasses…. Labor Relations: Relations between management and labor were good throughout the year. All grievances were amicable resolved under the provisions of the agreement between the company and the union…. Houses and Buildings: The continuance of necessary repairs and minor alterations to company houses kept village services at a high level throughout the year….All houses in three vacated villages, as well as the former Hakalau hospital building were sold to employees on a removal basis….Two unoccupied bachelors’ quarters in Hakalau upper village were remodeled and converted into offices for the industrial relations and industrial engineering departments. More information about life on the Hakalau Plantation in 1956 is presented in the Voice of Hakalau, the plantation's newspaper. For 1956, there are 3 editions available: January, June, and July. ​Presidents Report (Boyd MacNaughton) :…Net income after taxes was $14,185 in 1957 compared with $42,422 in 1956 and $85,501 in 1955. Of the 1957 net income, $6,902 represents a non-recurring gain on securities sold during the year. The close margin upon which this plantation is operating cannot be over-emphasized. In 1956 Hakalau embarked upon a nine year program for the development of its road system in order to further mechanize operations. … Only by the addition of these roads and a resultant increase in operating efficiencies, can Hakalau be expected to provide a more satisfactory return. On February 1, 1958, the date on which the company’s contract with the International Longshoremen’s and Warehousemen’s Union expired, the union called an industry-wide strike. The strike, now nearing the end of its second month, has been 100 percent effective in halting production here and throughout the industry.…Undoubtedly the strike will result in a smaller than anticipated crop in 1958 due to the limited capacity of harvesting equipment and the mill. The extent to which production will be curtailed depends entirely upon how much longer the men remain off the job. Harvesting and Transporting Methods: Hand harvesting was all but eliminated by the end of July with only one flume field in operation on a part-time basis during the balance of the year. Due to the transportation difficulties of an incompleted road network, and the late delivery of essential cane hauling equipment, there was often insufficient cane to keep the factory operating at top speed. … Operating conditions in general were severe throughout the entire year, and much credit is due our organization for its splendid work in getting the crop completed. Factory: The factory operated under difficult conditions due to the inability of the cleaning plant to handle the increased volume of mechanically harvested cane.…Difficulty in maintaining steam pressure due to dirty bagasse, and the necessity of slowing down the rate of grinding due to poor cane delivery caused a sharp drop in operating efficiency.…An entirely new cleaning plant was installed during the 1957 off-season. This installation…should materially improve the grinding operation during 1958. Roads: Early in the year, the Hakalau Board of Directors authorized a large-scale road building program, following a master plan prepared during 1956 with the assistance of the Industrial Engineering Department of C. Brewer and Company…The plan calls for the construction by 1962 of 87 miles of new roads for a total cost of approximately $1,500,000…Programmed construction for 1957 was 18.5 miles and actual construction totaled 19.7 miles with an expenditure of $348,199….During 1958, plans were to construct approximately 30 miles of roads, with many roads to be built into extremely rough terrain in the Ninole section of the plantation. The current sugar strike has halted all road construction. As the programmed roads were to have converted over 1,100 acres of cane area from hand to mechanical harvesting, a protracted strike may cause serious operational difficulties. Block Harvesting: A system of block harvesting has been worked out in conjunction with the master plan for road construction.….Overall benefits from block harvesting should prove substantial. It will concentrate harvesting and cultivating operations in large, well-defined areas, thereby affording better means of supervision and cost control. Labor Relations: Rapid conversion from hand to mechanical harvesting necessitated reduction in our work force during the year….In conformance with the terms of the agreement between this Company and ILWU Local 142, the services of 150 employees were terminated between February and July, 1957…A one-day work stoppage in November marred otherwise satisfactory labor-management relations during the year. Houses and Buildings: Company houses and buildings were kept in good repair throughout the year…Several vacated houses in outlying villages were sold to employees for removal from the premises. More information about life on the Hakalau Plantation in 1957 is presented in the Voice of Hakalau, the plantation's newspaper. For 1957, there are 3 editions available: February, April, and October. ​President’s Report (Boyd MacNaughton): A total of 17,750 tons of 96° sugar was produced in 1958, including 7,849 tons processed for growers. The original estimate for the 1958 crop was 28,000 tons, the drastically reduced production being attributable to the four-month-long industry-wide work stoppage and the limited factory capacity, which made it impossible for Hakalau to catch up on lost production….Net loss after taxes was $412,371, compared with $14,185 profit after taxes in 1957. The development of Hakalau’s road system, begun in 1956, was also disrupted… Of the thirty miles scheduled for construction during 1958, twenty miles were completed. Hakalau cannot be expected to provide a satisfactory return until such time as its roads are completed and the resultant operating efficiencies are effected. Factory: …Rocks are becoming an ever increasing problem, and this condition will undoubtedly become more acute as mechanical harvesting is expanded into the upper Kamaee fields. Roads: A total of 19.5 miles of new road was constructed during the year. While this was far short of the programmed construction of 28 miles, it can be considered a remarkable achievement due to the fact that all road building was halted by the strike. Periods of heavy rainfall delayed road construction in July and August but good progress was achieved during the last three months of the year. Labor Relations: A settlement of the industry-wide strike which began on February 1 was reached on June 9, 1958…Failure of the garage force and factory machine shop crew to report for scheduled duty during a weekend in December disrupted otherwise satisfactory management-labor relations during the remainder of the year. Houses and Buildings: …The availability of vacant houses in centrally situated villages made possible the relocation of employees residing in outlying areas. Factory: Start of grinding was delayed by almost three weeks due to repairs to the water drums in the Stirling boilers. ….further delay was caused by the breaking of a tooth on the main drive pinion in the first reduction gearing, and regular off-season repairs had to be postponed until March, 1960 pending the arrival of a replacement pinion. Roads: The first phase of the road building program was completed with the construction of 15.2 miles of new roads in 1959. All of the area scheduled to be converted from fluming to trucking under the master plan for road construction has now been completed. Road construction during 1960 and 1961 will be concentrated on improving in-field delivery of cane in fields now being serviced by an inadequate road system, and in widening and improving roads to be used as primary and secondary arteries. These improvements are essential to efficiency in cane delivery.